Preheat oven to 350°F. Combine dry ingredients in a bowl and wet ingredients in another bowl. Pour wet ingredients into dry ingredients and fold together until a smooth batter forms (don't overbeat it). Divide batter between two greased 8 x 5-inch loaf pans. Sprinkle with chopped pecans and a decent helping of sugar. Bake for about 40 minutes or until a toothpick inserted in the center comes out clean. Allow loaves to cool completely on a cooling rack before slicing or serving. What’s nice about days with inclement weather is I am forced to stay inside (OK, not forced, but I’m not much a fan of wind, rain and other equally lovely elements), and it makes for a good excuse to bake. Whether the air is just chilly or the sky is falling, sometimes nothing else cheers me up more than a warm oven with a sweet and delicious treat baking inside. 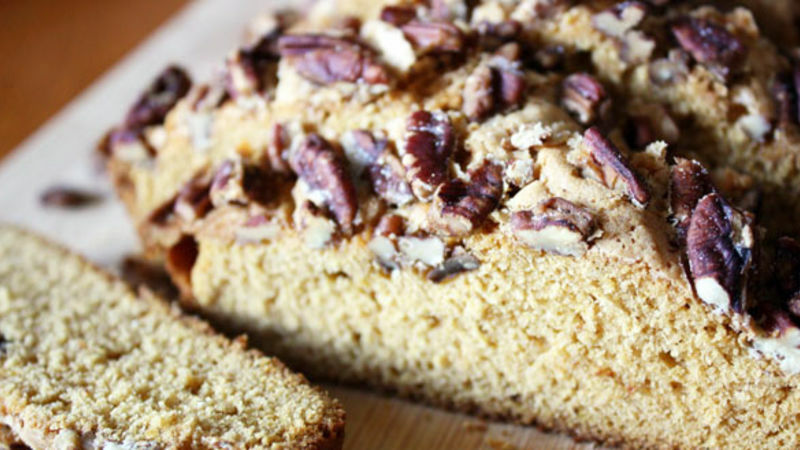 So when bad weather hits, I find refuge in this Pumpkin Quick Bread recipe. You see, I can never get tired of pumpkin recipes. Along with apples and cinnamon, they are the quintessential fall ingredient. And with fall rearing its cool head these days, the best way to cope is to make the best of the season. And this bread does the trick. This loaf is very easy and quick to make, with simple ingredients and a lot of wiggle room. Though I divided my recipe between two pans, if you want a taller loaf, just pour the batter into one pan and bake it for an hour. Also, if you’re a big fan of nuts, fold in walnuts or pecans in the batter instead of just sprinkling them on top of the loaf. Finally, have fun with this recipe – add some spices or raisins, flaxseeds or oats. However you decide to bake it, it’s the perfect way to warm up your home on a blustery day.